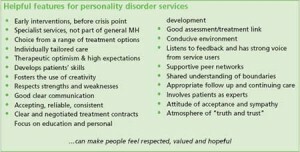 Identifying what works in the treatment of Personality Disorder is a complex question for several reasons. There are a range of perspectives on the effective treatment of PD, from psychological therapies, social support and medication to appropriate housing, benefits and advocacy advice, education, vocational and employment opportunities etc. During the initiation of the National PD Programme service users were consulted on helpful and unhelpful features of services.